Quinnipiac moved its record to 5-0 this past weekend with a swept of American International College winning 4-1 Friday followed by a 9-2 thrashing Saturday night. With the win Quinnipiac moved up to #15 in the USCHO.com poll and #12 in the USA Today poll. ECAC play begins this coming weekend when the Bobcats head to Harvard and Dartmouth as they look to validate their great start to the season. Now let's take a look at how some of the future Bobcats did this past week. A week after winning USHL goaltender of the week, Evan Fear took a hard fought loss in goal with a 3-2 overtime loss. He made 31 saves in the effort for Green Bay. The following night he struggled giving up five goals in a loss to Central Illinois. He faced 42 shots that night which was the second most shots he faced this season. In seven games played he is 3-3-1 with a 2.97 goals against average and a .914 save percentage. Justin Robbins picked up an overtime win for the Chicago Steel with a 33 save effort in a 4-3 win over Cedar Rapids. In 9 games played he has a 4-3-1 record with a 3.98 goals against average and a .870 save percentage. Matt Fawcett picked up another goal for the Powell River Kings. He is now averaging a point per game in the BCHL with 17 points (7 goals, 10 assists) in 17 games played and is third on the team in scoring. Tyler Ghirardosi recorded on assist two games played for the Trail Smoke Eaters over the weekend. In 17 games he has 11 points (5 goals, 6 assists). Skyler Brind'Amour had a goal in three games played for the Chilliwack Chiefs. He has 14 points (4 goals, 10 assists) in 21 games played this season. 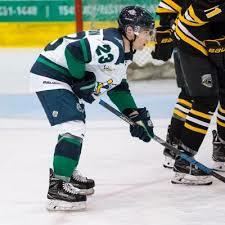 Corey Clifton is riding a five game point streak for the Surrey Eagles. This past week he had a goal and two assists in three games played and in his last five games has three goals and four assists. On the season in 21 games played, Clifton has 13 points (4 goals, 9 assists). PJ Fletcher has started to pick it up on the score sheet. He had a two point week with a goal and an assist in three games played. He now has 4 points (1 goal, 3 assists) in 18 games played for the Wenatchee Wild. Nick Kent picked up two more assists in two games for the Buffalo Jr. Sabres. In 19 games played he has 11 points (2 goals, 9 assists). Cam Boudreau had two assists in three games played for the Junior Bruins. The New Hampshire native has 7 points (2 goals, 5 assists) in 15 games played. Quinnipiac picked up a new commit in 2000 born goaltender Yaniv Perets a Montreal native playing for the Junior Bruins. In 14 games played Perets is 12-1-0-1 with a 1.90 goals against average and a .944 save percentage with three shutouts this season. 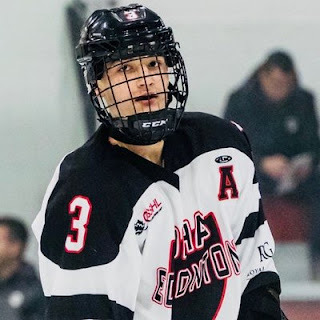 Defenseman John Campomenosi picked up an assist in three games played. He now has five assists in 17 games played for the Jersey Hitmen. Connor Tait had a really strong weekend. In three games played he had four points (2 goals and 2 assists). In 12 games played he has 5 points (2 goals, 3 assists). Oscar Plandowski had a huge week for the Selects Academy U-15 team at the South Kent School. He had 7 points (2 goals, 5 assists) in four games played. In 23 games played he has 31 points (6 goals, 25 assists). Jack Silich had a 7 point weekend with 2 goals and 5 assists in three games played for the Chicago Mission U-15 team. On the season he has 51 points (21 goals, 30 assists) in 31 games played.